Playa Dorada, East Beach – Artistically designed beachfront 2bd/3ba townhome with detached 1bd/1ba casita overlooking the Sea of Cortez. Approximately 2000 sq ft including garage. All furnished, classic mexican decor. Playa Dorada has one of the most beautiful, pristine, rock less beaches in Rocky Point, 24 hour security, 2 miles to golf course and international airport. Newer state of the art (off grid) solar electric, good for another 10 years; making this an energy efficient, green home. Saltillo tile floors and double pane windows. Covered beach porch with extended patio. Artist designed mosaic and mexican tile through out. Master bedroom has large picture window with gorgeous ocean views, terrace and its own fireplace. Guest bedroom has mountain views and small terrace. This is a must see! Casita has beautiful balustered staircase, full custom bathroom, built in desk with mirrow, custom designed mexican tile countertop, cabinets, gas range, fireplace, terrace with rustic bentwood furniture, blue mountain desert views. Garage is big enough for your car and toys. Lots of storage, sink, emergency water tank, propane refrigerator, electric garage door opener. Custom wooden arched double doors open onto a lovely tiled patio, flower bed with artist made mosaics. • single story – $78,000. Las Lagrimas, Black Mountain – Large lot, 39 hectares ready for your development, or perfect for a ranch. This is about 8 miles from the Sandy Beach area or ocean. Perfect for your ranch home at only $.20 cents a square meter. Lot can be divided. Just outside Lomas Campestres. • single story – $60,000. Whale Hill, Puerto Penasco/Rocky Point – Nice Oceanview lot at the base of Whale Hill, adjacent to Hotel de Cortez. In the popular Mirador area where many restaurants and night clubs are. Lot can be split. Option to purchase adjacent lots for a total package deal of 2,356 square meters. This lot can be residential or commercial and owner has plans to build a 32 unit condominium project. Soil test and building plans available. Water to lot line. City electricity & sewer available. Owner will carry! • 1,250 sq. ft., 3 bath, 3 bdrm single story – $230,000. Villas del Mar, El Mirador – Artistic features in this furnished 3bd/3ba oceanfront townhome with upgraded dual pane windows and custom storm shutters. Nice covered porch with built-in barbeque for entertaining and watching dolphins go by and for those amazing sunset views. Custom wood cabinets, doors and closets, and ceiling wood trim molding throughout. This home is well taken care of. No HOA fees. 2 car Garage that has high ceilings. Wrought iron on windows. Great rental. Bank Trust in LLC for low closing costs. Located in central area near restaurants, bars and shopping. This is a must see! 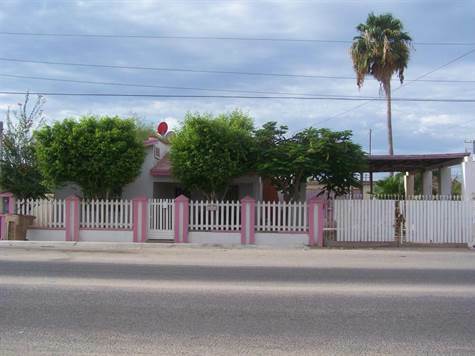 • lot / land – $23,000. Large lot, 76 hectares ready for your ranch or endless possibilities. This is about 10 miles from the ocean. Perfect for your ranch home at only $.03 cents a square meter. Lot can be divided. • 51 sq. m., 1 bath single story – $60,000. Money maker! 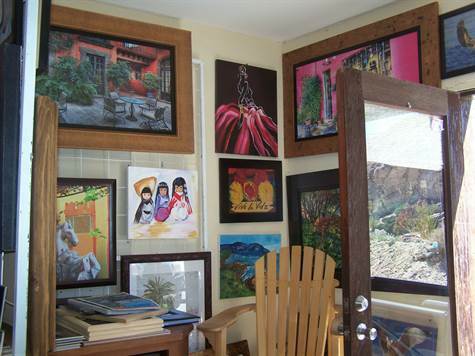 Old Port, Puerto Penasco/Rocky Point – Great opportunity to own a framing business with a clientele list and raw materials included. Yes this includes the 549 square foot building in the tourist area of Old Port. This business brings in approximately $50k pesos a month conservatively, records can be provided. Option to buy back residence which is a 1bd/1ba with kitchen and extra storage room for $40k so that you can live on the premises and watch the ships go by with great ocean views. Owner is willing to train.